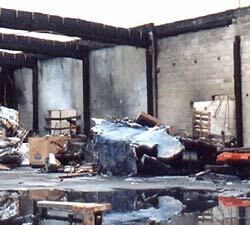 On September 23, 1997, a six-alarm fire swept through our concrete tilt-up warehouse. The fire also destroyed adjoining concrete warehouses of another owner. That owner decided to raze the buildings and sell the land. Our dilemma: do likewise, or try to repair it? We did not follow the lead of the neighboring property owner. Instead we asked an engineer to recalculate the strength of the fire damaged concrete wall. Was it strong enough to support a new roof? The engineer determined that only two inches of the eight inch wall were damaged by the fire. He redesigned the roof to accommodate the weakened walls. The warehouse was rebuilt instead of razed and is now the home of an AAA tow truck depot.